ISLAMABAD: Nobel peace laureate Malala Yousafzai returned to Pakistan yesterday, saying tearfully that it was “a dream” to come home for the first time since she was airlifted to Britain after being shot in the head by a Taleban gunman more than five years ago. The 20-year-old was overcome with emotion as she made a televised speech from the Prime Minister’s House in Islamabad, wiping away tears as she spoke of the beauty of her native Swat valley. “Always it has been my dream that I should go to Pakistan and there, in peace and without any fear, I can move on streets, I can meet people, I can talk to people. “And I think that it’s my old home again … so it is actually happening, and I am grateful to all of you.” She had arrived unannounced with her parents under tight security overnight. Pakistanis awakening to the news she was back in the country flooded social media with messages of welcome, with many hailing her bravery-but others accusing her of a conspiracy to foment dissent. Malala is widely respected internationally as a global icon for girls’ education, but opinion is divided in Pakistan, where some conservatives view her as a Western agent on a mission to shame her country. Residents of Swat said they were happy to see her return. “I had not imagined that she would ever come (back),” Rida Siyal, a student who said she had been a “good friend” of Malala’s before the shooting, said. “(She) defeated the dark force of fear. We are delighted to see her back,” she said. Ahmad Shah, who said he was a friend of Malala’s father, called her a “symbol of courage”, adding: “She should have returned home much earlier”. Malala became a global symbol for human rights after a gunman boarded her school bus in Swat on October 9, 2012, asked “Who is Malala?” and shot her. She was treated for her injuries in the British city of Birmingham, where she also completed her schooling. The youngest ever winner of the Nobel Peace Prize in 2014, she has continued to be a vocal advocate for girls’ education while pursuing her studies at Oxford University. 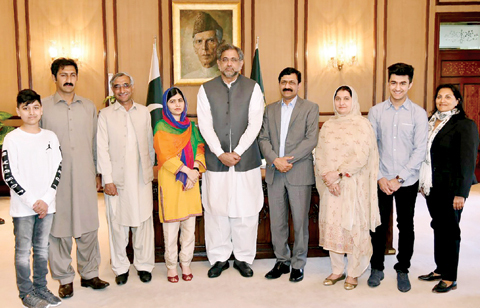 Malala met with Prime Minister Shahid Khaqan Abbasi earlier yesterday and later took questions from an audience. “We have amazing women,” she told them in comments broadcast on state television, pushing for more education and critical thinking. She also called on Pakistanis to come together, stressing unity for the betterment of the country. But among the messages of welcome are pockets of intense criticism from some Pakistanis, including hardline Islamists as well as members of the conservative middle class who support education for girls but object to airing the country’s problems abroad. One leading Pakistani journalist, Hamid Mir, issued a plea for restraint when talking about her visit, warning that negative reactions “will damage Pakistan’s image”. Other Pakistanis echoed his concerns on social media. “Dear Pakistanis! Malala is not your enemy. Your enemies were those monsters who shot her point blank on her way to school,” wrote Twitter user Shahira Lashari. Her schedule for the four-day trip is being closely guarded. “She will be meeting several people here but her itinerary is not being disclosed due to security reasons,” foreign office spokesman Muhammad Faisal said. Malala began her campaign aged just 11, when she started writing a blog-under a pseudonym-for the BBC’s Urdu service in 2009 about life under the Taleban in Swat, where they were banning girls’ education. In 2007 the Islamist militants had taken over the area, which Malala affectionately called “My Swat”, and imposed a brutal, bloody rule. Opponents were murdered, people were publicly flogged for supposed breaches of sharia law, women were banned from going to market, and girls were stopped from going to school. But it was only after the shooting, and a subsequent near-miraculous recovery, that she became a truly global figure. During a recent appearance at the World Economic Forum in Davos, the feminist campaigner urged women to act without waiting for men.